Via drug repurposing, a team of researchers led by animal biologists at Nagoya University has discovered compounds that can either shorten or lengthen the circadian rhythm in human cells. A steroid hormone, dehydroepiandrosterone (DHEA), also known as a common anti-aging supplement, demonstrated period-shortening activities, and when it was fed to mice, jet lag symptoms were significantly reduced. Further screening of known bioactive compounds may lead to the discovery of other effective compounds that can treat circadian clock disorders arising from jet lag and shift work. The experiments were carried out through a joint research collaboration between researchers at ITbM, National Institute for Basic Biology, Kyoto Prefectural University of Medicine, and Kindai University. The group used high-throughput chemical screening of existing drugs and bioactive compounds to explore their effect on circadian rhythms, according to a study reported inEMBO Molecular Medicine. The researchers identified various hit compounds that can regulate the circadian rhythm in human cells, including a well-known anti-aging supplement that was able to reduce jet lag in mice. Many frequent fliers who travel across time zones tend to suffer from jet lag, which is caused by a mismatch between external time cues (shifted day/night cycle) and their biological (circadian) clock. The circadian clock in humans has an approximately 24-hour rhythm, and the circadian rhythm plays an important role in regulating sleep/wake cycles, hormone secretion and metabolism. Therefore, chronic disruption of the circadian rhythm arising from jet lag or shift work (circadian desynchrony) may lead to sleep disorders, obesity and an increased risk of cancer in the long term. Although jet lag usually triggers a number of undesirable symptoms, effective drugs or supplements to cure it remain scarce. Most of the drugs circadian biologists have discovered to reduce jet lag in mice require injection into a specific region of the brain, which is not very practical. Takashi Yoshimura, an animal biologist and Professor at ITbM, Nagoya University, decided to use a drug repurposing strategy, a technique to identify new functions for existing bioactive compounds. He sought compounds that can regulate the circadian clock and might be useful for the treatment of jet lag. Developing new pharmaceuticals is usually costly and time-consuming, as demonstrated by data showing that a single drug costs billions of dollars and takes up to 13 to 15 years to reach the market on average. Therefore, drug repurposing is a popular approach to develop new drugs. Famous examples of drug repurposing include the redevelopment of minoxidil, originally launched on the market as a vasodilator, repurposed for hair growth, as well as sildenafil, an antihypertensive, repurposed for the treatment for erectile dysfunction and marketed as Viagra. "In 2015, we had reported the synthesis of a molecule with demonstrated period-shortening activities on mammalian circadian clocks discovered through a collaboration between ITbM's chronobiologists, synthetic chemists and theoretical scientists," says Yoshimura. "Unfortunately, this compound was rather toxic, which led me to think more about the safety of molecules. I then considered that drug repurposing would be a better approach to identify compounds that can be used to treat jet lag, as the toxicity and mode of action of existing drugs would have already been investigated." The research group conducted high throughput screening of over 1000 compounds consisting of existing drugs, including those approved by the Food and Drug Administration (FDA) of USA, Europe or Asia, and drugs under clinical trial, to search for drugs that can regulate the circadian rhythm in mammals. Circadian clock research has been ongoing for many decades and has led to the discovery of molecular mechanisms controlling the circadian rhythm, which was awarded the 2017 Nobel Prize in Physiology or Medicine. Almost all cells contain a circadian clock controlled by a central circadian pacemaker located in the hypothalamus of the brain. The circadian clocks contained in most tissues and cells are driven by transcriptional-translational feedback loops composed of circadian clock genes and proteins. Two clock proteins, Circadian locomotor output cycles protein kaput (CLOCK) and Brain and Muscle Arnt-like1 (BMAL1) bind to each other to form a heterodimer complex, which then binds to a DNA sequence called E-box (CACGTG) located in the upper region of clock genes Period (Per) and Cryptochrome (Cry), present in the genome. This activates the transcription and translation of Per and Cry genes, leading to the generation of clock proteins PER and CRY. PER and CRY proteins form a dimer, which then inhibits their transcriptional activators, CLOCK and BMAL1. Activation and inhibition by clock genes and proteins constitutes a transcriptional-translational feedback loop, which completes a cycle once a day, thus generating a 24-hour circadian rhythm in various physiological and behavioral processes. The research team screened various drug libraries by setting up a system in which they observed the daily transcription of the clock gene Bmal1 through monitoring of a bioluminescent rhythm using the firefly's bioluminescence (luciferase) gene. Each drug was added to a 384-well plate containing human cells (U2OS) transfected with the luciferase gene. As a result of high-throughput screening of over 1000 existing drugs, the team found 59 hit compounds that affected the bioluminescent rhythm. Among these drugs, 46 compounds lengthened the circadian period, and 13 compounds shortened the period. These hit compounds contained bioactive molecules that are used as anti-cancer, anti-bacterial and contraceptive agents, hormones, vitamins, as well as treatments for diseases related to the central nervous system, digestive system, the heart, and skin. The results of their studies suggest that approximately 5 percent of the drugs currently on the market may have some effect on our circadian rhythms, depending on their dose and duration of administration. "I was really excited to find hit compounds that had period-changing effects on human cells and wanted to test them immediately in mice to see if the drugs could relieve jet lag symptoms," says Yoshimura. "Many members in our group were hesitant though, as they thought that the effects observed in cells were too small, but I had no doubt that the results would translate from the cell level (in vitro) to the animal level (in vivo)." For most travelers, flying west (e.g. from Asia to Europe), which delays the circadian clock, does not cause too many health problems. On the other hand, flying east (e.g. from Asia to America), which fast-forwards the circadian clock, forces people to wake up earlier than usual and tends to cause severe jet lag symptoms such as fatigue and insomnia. Therefore, Yoshimura and his group decided to investigate circadian period-shortening compounds that will fast-forward the circadian clock and relieve jet lag symptoms when travelling east. Among the 13 circadian period-shortening compounds that the group identified, the researchers focused on a steroid hormone, dehydroepiandrosterone (DHEA), which is commercially available as an anti-aging supplement in USA. In humans, DHEA is produced in the adrenal gland, gonads and brain, and is a precursor for testosterone and estrogen. DHEA is one of the most abundant circulating hormones in the blood stream, but its concentration usually decreases with age. This is why DHEA is sold as a supplement for anti-aging and for boosting metabolism. Further investigation showed that DHEA shortens the period of the circadian clock in cultured human cells in a dose dependent manner. The team found that DHEA speeds up the circadian rhythm in human cells, as well as in cultured cells and tissues of mice. As previous studies have demonstrated the safety of orally administering DHEA in mice, experiments were carried out to test whether DHEA had an effect on the circadian rhythm of mice. "When we fed DHEA mixed with powdered food to mice, we were surprised and pleased to find that DHEA shortened the circadian period in mice," says Katherine Tamai, a postdoctoral researcher in Professor Yoshimura's group who mainly conducted the experiments. "We then did a jet lag experiment where we placed the mice under light/dark conditions and then advanced the cycle by 6 hours, which is similar to a time shift encountered when travelling from Japan to Alaska. Jet-lagged mice that were fed DHEA appeared to recover and adapt to the new time zone faster than mice that were fed normal food. On average, mice fed DHEA recovered from jet lag in about two to three days, whereas mice without DHEA took about five to six days for their activities to readjust to the new light/dark cycle," she describes. "I started this research in 2016, and being a biologist who worked mainly with fish, I was afraid at first to test the drugs out on mice, but Professor Yoshimura was very optimistic and confident that this experiment would work, and his persistence paid off," says Tamai. The simple solution appears to be to take DHEA to cure jet lag, but one important issue is that the circulating levels of DHEA in mice and humans is different. The reason why DHEA may have been so effective in mice may be because the initial circulating concentration of DHEA is significantly lower in mice (approximately 15 percent) compared to humans. 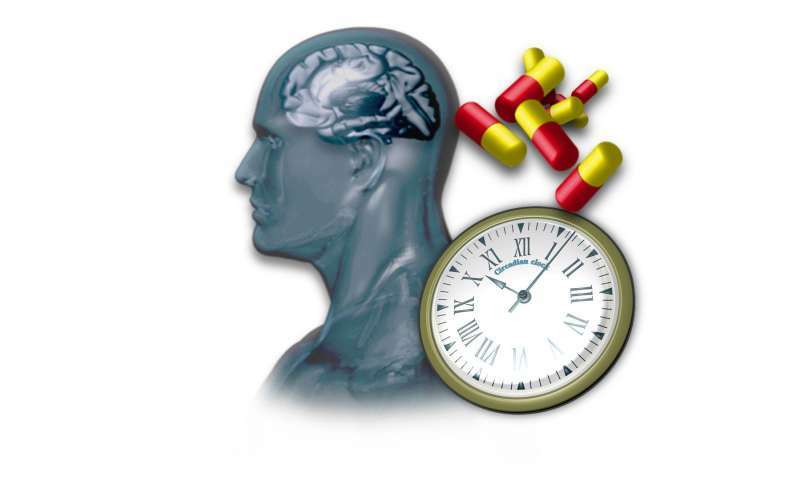 Also, extremely high doses of DHEA have actually led to lengthening of the circadian period. Therefore, further investigation is required to evaluate the actual effectiveness of DHEA for the treatment of jet lag in humans. "Our studies have shown that DHEA probably acts primarily on the peripheral circadian clocks rather than on the master clock in the central nervous system, which has control over clocks in the entire body," explains Yoshimura. "In order to completely relieve jet lag, it is necessary to adjust both the central and peripheral circadian clocks. We envisage that DHEA may be effective when taken along with another drug that acts upon the central circadian clock." Using drug repurposing, Yoshimura's group not only identified circadian rhythm changing drugs, but also succeeded in identifying genes that are involved in the regulation of the circadian clock. The group identified several tyrosine kinase inhibitors that affected circadian rhythms and found evidence suggesting that the Abelson murine leukemia (ABL) and breakpoint cluster region (BCR) protein kinases are involved in the regulation of the mammalian circadian clock. Tyrosine is an amino acid present in proteins that contains a hydroxyl moiety, and kinases are enzymes that catalyze phosphorylation (addition of a phosphate group) of various substrates in the cell. Hydroxyl, amine and carboxyl moieties in proteins can be phosphorylated, which modifies the proteins to switch them on or off for various functions. Previous reports have shown that in a genetic abnormality called Philadelphia chromosome, fusion of ABL and BCR genes cause leukemia. However, the exact roles of these genes in the normal state have remained unknown, as genetic knockout of these genes is lethal. Yoshimura's group have screened existing drugs to discover that these enzymes for phosphorylation arising from ABL and BCR genes are involved in the regulation of the circadian clock, thus proving that chemical genetic approaches are useful for circadian clock research. "We are currently expanding our chemical libraries and are now screening food additives and natural products to find compounds that can regulate the circadian rhythm in humans," says Yoshimura. "We hope to develop and be able to deliver new and safe compounds that can be taken orally to cure jet lag."